HomeEnvironmentGadgetsGreen ProductsHighTechLifestyleSmartphonesMK3 Makes Your Outdoor Life More Smart and Convenient! MK3 Makes Your Outdoor Life More Smart and Convenient! Generally, outdoor activities need a bunch of gadgets for many reasons, such as basic communication thru Bluetooth or Wi-Fi, emergency response, entertainment, lighting, productivity and more. If you are into hiking with your family members, traversing the outdoors, climbing hills or peaks and would like to bask in the sounds of nature while keeping your gadgets close by. Carrying all these in your bag pack and its different operating requirement is really a challenging task for an adventurer. Now you can squeeze all these gadgets into a single device called ‘MK3’ that keeps you free and can really enjoy your trip safely with great experience. Los Angeles based HwBC Inc, a start-up Accelerator now brings ‘MK3’, a 5-in-1 smart outdoor gadget which comes with amazing features like an emergency button, a walkie-talkie Bluetooth pairing via Smartphone, Bluetooth speaker, Stylus pen and a LED light (emits 150 lumens, brighter than a regular Smartphone)! After successful Kickstarter campaign, this innovative product is currently live at Indiegogo and estimated delivery date for MK3 is March 2018. 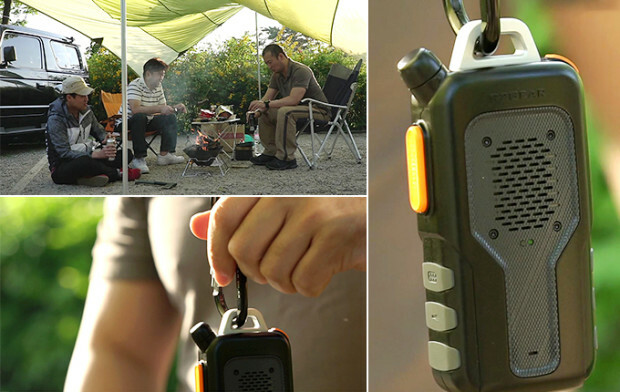 Like a professional explorer, you can enjoy a real walkie-talkie by pressing the button to talk. Its walkie talkie function is based on Zello app that makes a perfect replacement for smartphones during any outdoor activities; now forget about Smartphone damage due to fall, scratch, water etc. Without any distance restriction, it can be connected anywhere in the world where there is a communication network of LTE, 3G, and mobile communication companies. When you receive an incoming call, you simply press the button once. While talking on the phone, you can do whatever you want with your two hands. The MK3 replaces your traditional portable speakers for your outdoor activities. To listen to your favorite music, it functions as a speaker by connecting through Bluetooth pairing! Other impressive feature of this gadget - it comes with an IP67 level of moisture proof and dust proof. It has an embedded emergency button used in any emergency situations; it sends an urgent message to the designated user and simultaneously transmits the GPS information to easily know where the user is located! The creators of MK3 now work on diverse tests for waterproofing and improving the quality of the speaker to make it sound better. Earlier, they had a successful crowd-funding of MK1 in South Korea and attended a 2017 Beijing ISPO exhibition to introduce MK3.